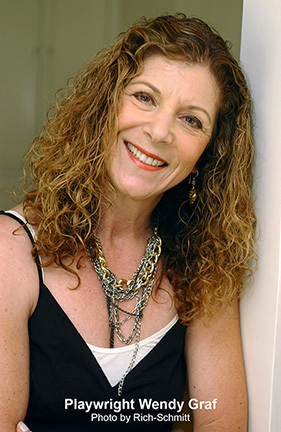 NEW YORK CITY (April 1, 2019) — Playwright Wendy Graf has been named the inaugural Gold Medallion winner by the Moss Hart & Kitty Carlisle Hart New Play Initiative for her play Exit Wounds. Graf’s play was one of two Silver Medallion winners that beat out 1241 plays (from five countries and 43 states) submitted to the Hart Initiative. Whittled down first to 23 semi-finalists, then eight finalists, four Bronze Medallion-winning plays received readings at New York City’s 59E59 Theaters last summer as part of the Jeremy Nussbaum New Play Reading Series. The resulting two Silver Medallion winners, Exit Wounds and Confederates by Suzanne Bradbeer, were produced at the Grove Theater Center in Burbank in Oct.-Nov. 2019 in the final step of the process. A story of healing, hope and compassion, Exit Wounds looks behind the “ripped from the headlines” sensationalist story of a horrific tragedy to explore its effect on three generations of the perpetrator’s family. How do you find redemption when someone you love has committed a terrible crime? Can the families of the evildoers ever live a normal life again, or are they forever defined by the actions of one member? Other plays by Wendy Graf include Unemployed Elephants–A Love Story (Victory Theatre –Stage Raw Top Ten; Stage Scene LA “Scenie” awards for outstanding production and two-hander); Please Don’t Ask About Becket (Electric Footlights at Sacred Fools Theatre); All American Girl (InterAct Theatre Company – Stage Raw Top Ten and 2015 award nominations for playwriting and solo performance, LA Weekly “GO!”, Stage Scene LA “Scenie” award for outstanding solo performance production, Better Lemons “Best of 2015” list); Closely Related Keys (Lounge Theatre, directed by Shirley Jo Finney – NAACP award for lead performance); No Word in Guyanese for Me (2012 GLAAD Award, Helen Hayes Award-recommended); Behind the Gates; Lessons (L.A. production directed by Gordon Davidson); and Leipzig (LADCC nomination; Garland Award for playwriting; Dorothy Silver finalist). Ms. Graf is a member of the Ensemble Studio Theatre/LA and Pacific Resident Theatre writing units, and of the Dramatists Guild of America. Details on the next cycle of the Moss Hart and Kitty Carlisle Hart New Play Initiative will be announced later this spring. For more information, go to www.HartNPI.org.